Who would not benefit from having their very own personalised laundry bag.? Great for using at home, on holiday or weekends away. Ensures that all dirty laundry is contained and not scattered all over the bedroom floor! A must for those families who have children at boarding school. Personalised with your chosen name and the washing machine symbol. We offer the bag is 3 fantastic sizes:medium 30 x 45cm, large 40 x 50cm and extra large 50 x 79 cm. 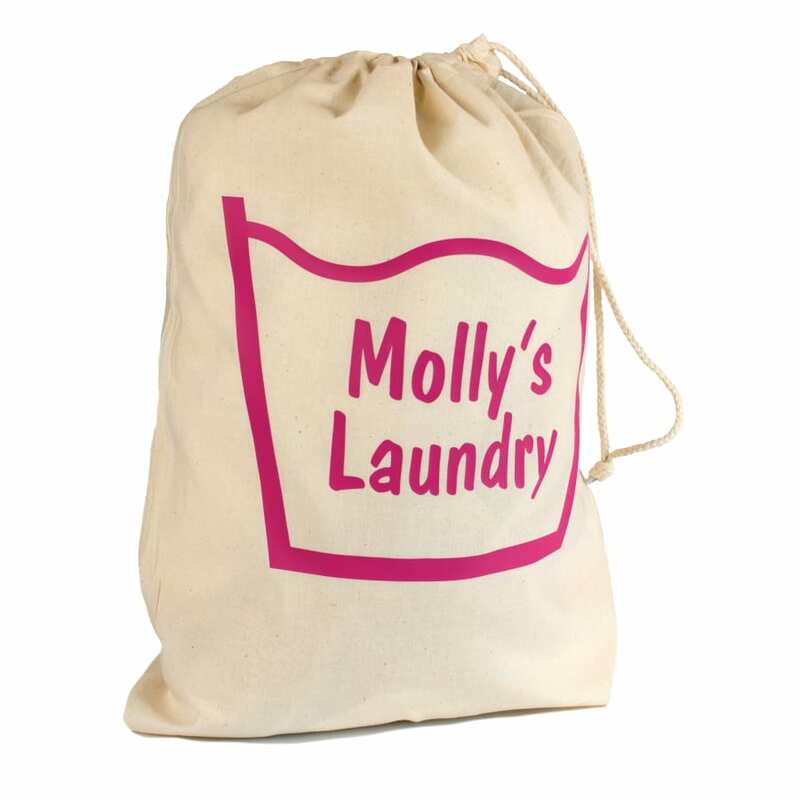 Customer have up to 2 lines of text available to personalise the laundry bag. You may wish to have the full name of the person or perhaps the initial/surname and then a boarding house name. Or as illustrated on this product page, a name and then a word of your choice. Some good examples are "Jack's Sports Kit", " Dad's Smelly Football Kit", "Molly's Laundry" etc. There is no maximum character restriction but please be aware that the longer the name/word the smaller the print will appear. All you have to do is choose the colour of bag and print and tell us what you would like printed. Personalised laundry bags are usually delivered within 3 days. Bags are 100% cotton and have a really useful drawstring rope closure. Bag may be hung on back of door or hook. Bags are machine washable but please do not iron directly over the design. Iron on reverse only. Every personalised laundry bag is hand printed by the team at Name it Labels in our wonderful Somerset Studio. As this item is personalised especially for you, it cannot be returned unless faulty or we have made an error. So we ask that you double-check your chosen options carefully prior to checkout. A personalised laundry bag makes a quirky but handy gift.